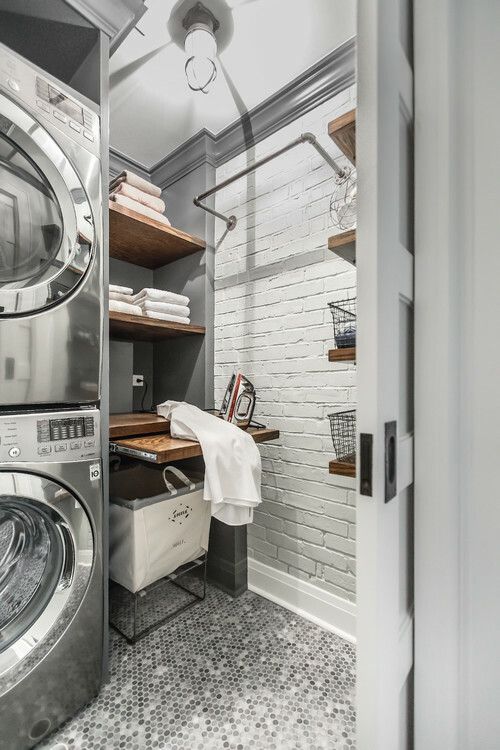 In keeping with the determination to stay organized beyond the first 90 days of a new year, we want to give some attention to a room that’s often overlooked when it comes to function and design, but one that’s vital to the home, nonetheless — The Laundry Room. 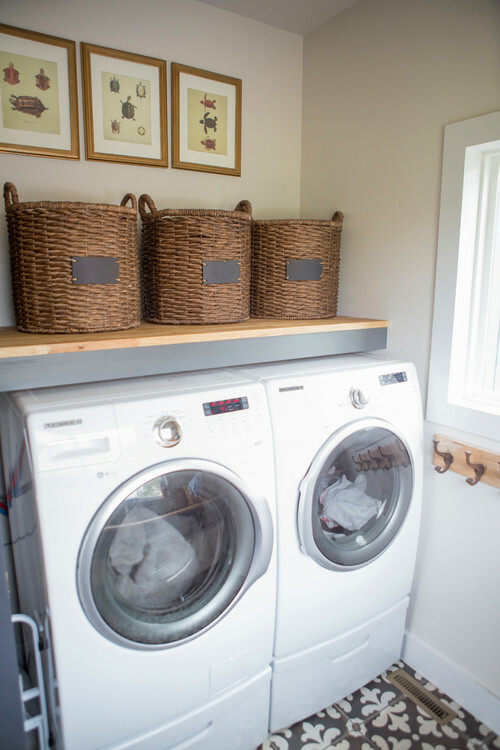 Think about it: A laundry room designed with intention makes doing laundry an easy chore. On the flip side, a laundry room that’s too crowded to stand in while holding a laundry basket and attempting to open the dryer door just adds frustration to your life every time you head down the hall with a basket of dirty clothes. Here are some ideas for organized, low-frustration laundry rooms to help home owners feel a little happier on laundry day. Most laundry rooms, it seems, are an architectural afterthought. For a washroom the size of a linen closet, consider stacking your washer and dryer on top of each other to save space. Vertical shelves and even a small area to iron help make this converted closet-turned-laundry space into a highly organized and functional one. Make the most out of minimal floor space. If you only have a single wall in a tight space to make it all fit, a shelf above the washer and dryer takes the struggle out of laundry baskets on the floor. The easily accessible shelf above the machines for laundry bushels ensures you’ll have uncluttered space to stand in while you load and unload clothes. As an added bonus, label the baskets for each member of your family so you can sort and deliver clean items back to their rightful owners. 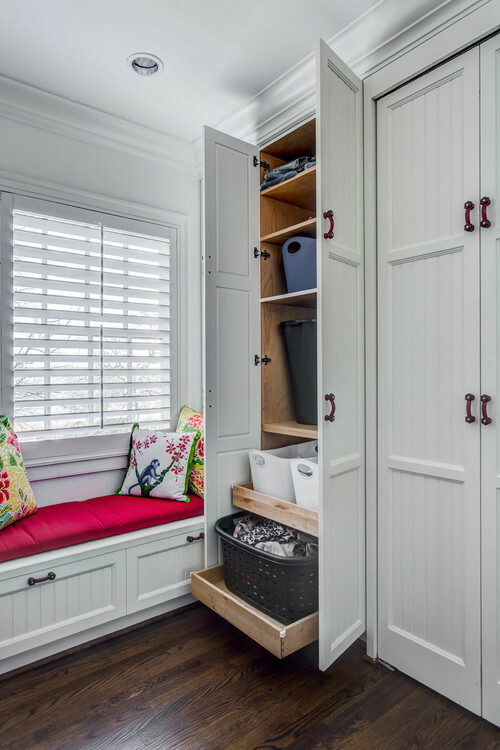 When you need the space for other things, like a window seat and built-in desk area for after-school projects, but you also want a utilitarian laundry space, consider concealing your washer, dryer, and everything else, until you need it. This now-you-see-it-now-you-don’t laundry room neatly and discreetly tucks away all the necessities behind attractive cabinetry. 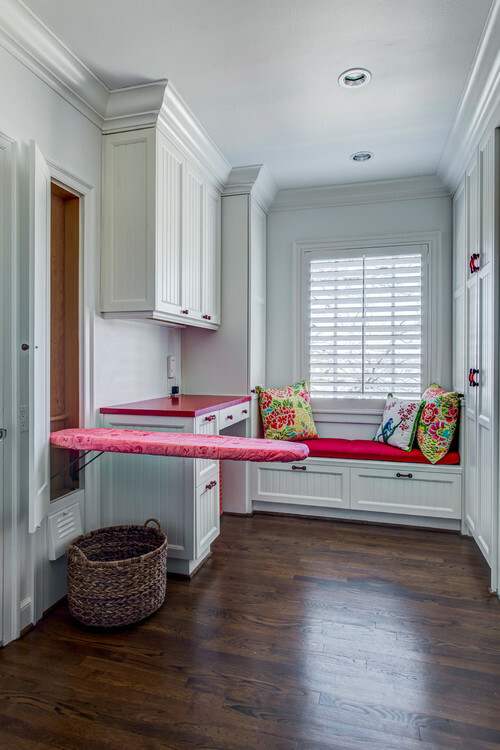 But, when it’s time to wash and fold clothes, this reading nook quickly converts into a practical laundry room with everything you need to fluff and fold, including a disappearing ironing board. What’s more, guests will never notice a pile of clothes spilling onto the floor when they pop by unexpectedly. 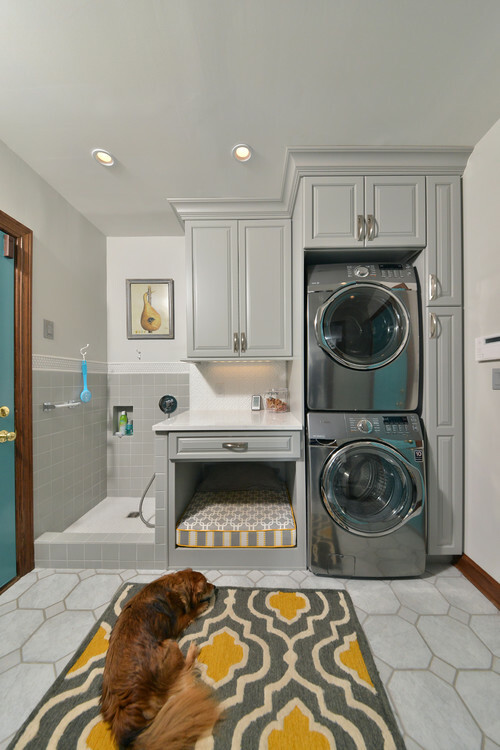 Dog-lovers can’t resist a laundry room that doubles as a space to bathe a furry friend and give him a cozy space to retreat next to the soothing sounds of the washer and dryer. 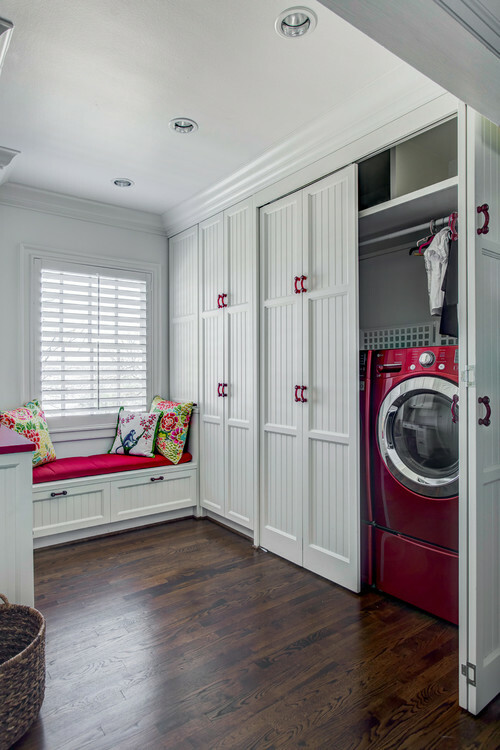 This laundry room packs a multipurpose punch combining stackable machines, cabinetry, a countertop, dog bed, and pet-friendly shower space. Note the neutral colors with a splash of warm gold for a homey feel. Even the most discerning canines approve.